After the Lord's Prayer, one of the most frequently said/chanted/sung hymns/prayers in the Orthodox Church is “O Heavenly King,” a prayer to the Holy Spirit. This hymn is appointed to be sung in several places for the Divine Services of the Great Feast of Pentecost, a several-day feast celebrating the Descent of the Holy Spirit. 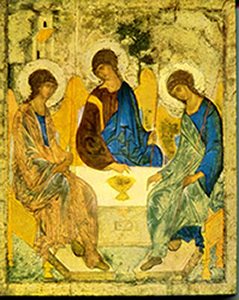 The first day of the feast is Trinity Sunday, because with the descent of the Holy Spirit, all Three Persons of the Holy Trinity reveal themselves, for the salvation of the world. The second day of the feast is Holy Spirit Day. For the Orthodox Faith, the revelation and descent of the Holy Spirit and the revelation of the Unity of the Holy Trinity are two aspects of the same reality. May this prayer/meditation on each of the 10 phrases of this magnificent hymn be a source of blessing for you, to commemorate the descent of the Holy Spirit not just on Pentecost, but every day of the year. 1. O heavenly King – 2. The Comforter – 3. The Spirit of Truth – 4. Who art everywhere – 5.And fillest all things – 6. Treasury of blessings – 7. And Giver of Life – 8. Come and abide in us – 9. And cleanse us from every impurity – 10. And save our souls, O Good One. Of our souls and our lives. Is what we think is strength. Who are most bereft of true strength. Of Your Holiness and Wisdom! Which only Your Presence can give. In the Presence of Light Itself. Grasping after shadows and illusions. Wishes us to believe are true. Even when we abandon You. Orphaned and bereft of love. To fill us with Your own Spirit! If only we could see the Truth. Instead of Your Holy Spirit of Truth. With such energy and ambition! Prestige and power, fame and "fun"
Are blessings worth spending our lives pursuing. Or thrown on the junk heap. The joy of Dancing in the Presence! Whereby we may become rich. Of darkness and death that we inhabit. Mistaking our shadows for realities. When You fill us, we are truly alive! And dwell every moment in Your Presence! When You take up Your throne in our hearts. Dwell in us, so puny and insignificant? The secret innermost center of our being? Is already within the inner space. Till we can no longer resist You! And open ourselves up to You. For without You we are lost! In the deluge of despondency? Only You can cleanse us from our pollution. So that we may truly see You. O how our hearts long for You, O Lord! 10. And save our souls, O Good One." In our own self-pity, ignorance and blindness. That we don't need to be saved. Blinded by our lack of love and trust in You. Have mercy on me a sinner." And longing to stand in Your glorious Presence!